This volume contains the proceedings of the conference on Manifolds, \(K\)-Theory, and Related Topics, held from June 23–27, 2014, in Dubrovnik, Croatia. 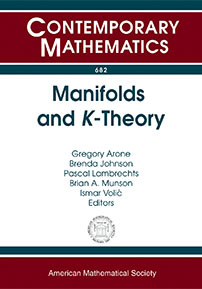 The articles contained in this volume are a collection of research papers featuring recent advances in homotopy theory, \(K\)-theory, and their applications to manifolds. Topics covered include homotopy and manifold calculus, structured spectra, and their applications to group theory and the geometry of manifolds. This volume is a tribute to the influence of Tom Goodwillie in these fields. Graduate students and research mathematicians interested in algebraic topology and k-theory.